The Sound Transit Board approved the nitty gritty business terms of two deals Thursday that will create hundreds of affordable housing units a short walk or a First Hill Streetcar ride away from its Capitol Hill Station light rail facility. Terms approved Thursday in one deal are worthy of the most complicated baseball trade involving a four-way swap between Sound Transit, Seattle Central and the state community college system, and Capitol Hill Housing. Seattle has money set aside to buy park land in the First Hill neighborhood. The First Hill neighborhood, however, doesn’t really have any park land for sale. The solution? Move $1 million $500,000 from the Seattle Park’s acquisition funding and invest it the neighborhood’s existing central green space — First Hill Park. UPDATE: An additional $500,000 to complete the project will come from the Swedish Medical Center public benefits package. Officers took a suspect in a reported domestic violence stabbing into custody Monday morning after a five-hour standoff with police inside a First Hill apartment building, SPD tells CHS. UPDATE: In a separate incident, 19th Ave E was closed off for part of the morning as authorities responded to a report of a “suspicious item” left at a Metro bus stop. More on both incidents, below. The future of Harvard Ave’s 106-year-old Knights of Columbus building is a massive adaptive reuse project sandwiched by two new apartment buildings, according to early planning by the property’s new owner, SRM Development. Police arrested a convicted drug dealer only days from when he had been ordered to begin his “community work program” after a reported attempted kidnapping of a child at a Boren Ave apartment building Saturday night. Now in its fourth year, First Hill Fidos filled the park with furry friends and their fans Thursday night. As the doggos marked their territory in our hearts, neighbors met each other for the first time, and some new friends were made in the process. Any hope of a First Hill light rail station being part of Sound Transit 3 appears to have been left in the dust after deliberation by the transportation agency’s Elected Leadership Group Thursday afternoon. CHS reported here on hopes from the First Hill Improvement Association and neighborhood and transit advocates that the rapidly growing, incredibly dense neighborhood would be included in planning for the coming third wave of Seattle-are light rail that will span a total of 11.8 miles and add 10 new and four expanded stations. West Seattle Alaska-Junction and Ballard routes will converge downtown by 2035. 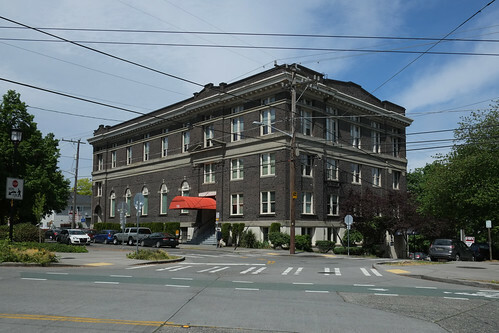 Depending on how you look at it, there is another historic Capitol Hill-area building lined up for sad destruction — or to be part of much needed redevelopment.